Wi-Fi solutions for the hotel and catering industries are always in focus: Guests and staff alike want reliable Internet access, both indoors and out. External antennas allow this outdoor access point to provide wide-area coverage, even on campsites or ski facilities. Your terrace, leisure facilities and distant rooms can have the best possible Wi-Fi, “Made in Germany”. 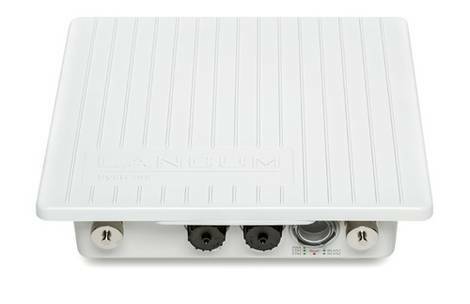 The LANCOM OAP-822 features two WLAN radio modules for the simultaneous operation at 2.4 and 5 GHz and offers a wide range of options for outdoor applications: The quick and easy setup of modern outdoor hotspots, professional WLAN coverage of open spaces, or even high-speed P2P links for connecting to remote buildings in the 5-GHz band via IEEE 802.11ac with a net data rate of up to 250 Mbps. The LANCOM OAP-822 has a robust IP66 protective housing, making it fully dust proof and water-jet resistant. What's more, a temperature range of -33°C to +70°C guarantees reliable operation even under extreme conditions. The LANCOM OAP-822 supports the WLAN optimization concept LANCOM Active Radio Control. This intelligent combination of innovative features included with the LCOS operating system - such as Adaptive Noise Immunity, Adaptive RF Optimization or Client Steering - sustainably increases WLAN performance and supports administrators with professional tools for WLAN management. Quick and easy network integration of the access points as well as automatic assignment of the configuration—without manual configuration. For WLAN controller or LANCOM Management Cloud-based installations, the access point receives an appropriate configuration immediately after network authentication. In combination with the LANCOM Public Spot option, the LANCOM OAP-822 is ideal for operating hotspots. Users benefits from a hotspot that is secure and easy-to-use, while hotspot operators can be sure that their own network remains separate from the guest network. Thanks to IEEE 802.11ac, the LANCOM OAP-822 supports highly powerful point-to-point links with up to 867 Mbps for wide coverage of open spaces and secure interconnection of remote buildings. Setting up a wireless network of this type spares you the need for laborious cable installations and expensive leased lines. The LANCOM OAP-822 supports the high-speed WLAN standard IEEE 802.11ac, so that you are well equipped for future challenges. What's more, LANCOM products are designed for a service life of several years and are equipped with hardware dimensioned for the future. Even reaching back to older product generations, updates to the LANCOM Operating System - LCOS - are available several times a year, free of charge and offering major features. Installation of highspeed point-to-point connections between complexes of buildings via the 5 GHz frequency band with a net data rate of up to 250 Mbps with parallel WLAN coverage in the 2.4 GHz frequency band.